Fixed restorations are one of the finest services rendered for dental patients to improve their comfort and mastication, maintain the health and integrity of the dental arches, and, in many instances, elevate the patient's self-image. The proper fit and cementation of cast restorations onto a prepared tooth using luting agent is crucial to both short- and long-term functions. Two-hundred die stone block samples were prepared using a stainless steel die with 10 grooves at 1 cm intervals of dimension measuring 10 cm × cm 1 × 0.5 cm. Impression of this stainless steel die was made using putty reline technique and then the die stone was poured. The models of the die stones were retrieved and sawed using a diamond disc into 1 cm × 1 cm × 0.5 cm dimension [Figure 1]a,[Figure 1]b,[Figure 1]c,[Figure 1]d. The dimension was kept 1 cm × 1 cm × 0.5 cm, so that it would almost resemble that of a prepared posterior tooth and flat surface of die stone blocks was used to achieve the actual die spacer thickness on die stone. 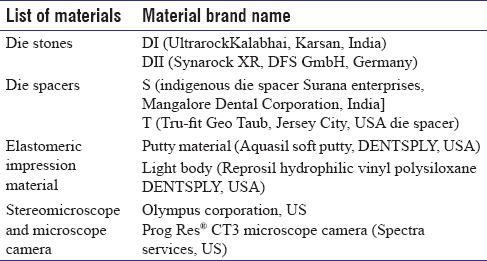 The die stone blocks were equally divided into DI (UltrarockKalabhai, Karsan, India) and DII (Synarock XR, DFS GmbH, Germany) on to which the die spacers S (Surana Enterprises, Mangalore Dental Corporation, India) and T (Trufit Geo Taub, Jersey City. USA) of two different colors silver and gold were alternatively applied after shaking the bottles for 30 s. Fifty samples from each group DI S, DI T, DII S, and DII T were sectioned after applying the respective die spacer to obtain 100 specimens in each group; these were further divided into five groups, each group consisting of 20 samples for 1, 2, 3, 4, and 5 layers of die spacer application left open at different intervals of time 0 h, 2 h, 4 h, 8h, and 24 h as shown in flow chart below [Figure 2]a. The above samples were sectioned into two halves after application of S and T on above and below surface at various time intervals 0, 2, 4, 8, and 24 h to obtain again 100 samples in each group. Each subgroup as shown in the flow chart of DI & DII samples [Figure 2]b were further divided with four specimens in each for 1, 2, 3, 4, and 5 layers of die spacer application (AP 1, Ap 2, Ap 3, Ap 4, and Ap 5) of die spacer. Prog Res® CT3 microscope camera SPECTRA services, US [Figure 5] and [Table 1]. Areas of irregularly thick layer of die spacer were not included to exempt the probability of porosities on the surface of sample. Onto the sectioned die sample, three widely placed die spacer thickness readings on top and below surface were recorded. A total of six die spacer thickness readings in each half were noted. So on the whole 12 readings were obtained from each sample. Die spacer thickness values in micrometer (μm) was recorded. The mean, standard deviation was calculated for the same. Analysis of variance (one-way ANOVA) was used to find the significance of study parameters between different die materials applied with different die spacers at various evaporation time intervals at 5% level of significance. Pair-wise comparison by Tukey's HSD post hoc test was carried out. The maximum mean thickness of 32.85 ± 0.28 μm for DIIT 24 h 5 applications and least of 13.80 ± 0.02 μm for DI S 0 h 1 application resulted, and also there is significant difference between various evaporation time intervals. Pair-wise comparison by Tukey's HSD post hoc test for die spacer thickness, after different applications at various evaporation time intervals on die stone, indicates that evaporation of volatile substances from die spacer affects the thickness of die spacer when applied on die stones [Table 2], [Table 3], [Table 4], [Table 5], [Table 6]. 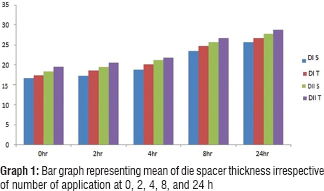 Die spacer left open for 2, 4, 8, and 24 h as compared with bottles open for 0 h affected the die spacer thickness and consistently increased by 104% 2 h for DIS, to 154% 24 h for DIIT [Table 7]. The mean die spacer thickness ranged from 16.64 ± 2.28 μm for DIS at 0 h to 28.74 ± 3.18 μm for DII, irrespective of number of applications [Table 8] and [Graph 1]. Die spacer thickness per brush application ranged from 7.06 μm per layer to 12.38 μm per layer. There is significant variation in per-layer thickness of die spacer at various time intervals. Null hypothesis is true as there is no statistical difference between DI and DII die stones when S and T were applied at various time intervals. Paint on die spacer for internal relief provides a space for the luting agent between the casting and prepared tooth; this space is dependent on the type of technique used for cementation., Application of die spacer result in reduced elevation of cemented complete crowns on prepared tooth compared with un spaced crowns.,, It also allow improved out flow of excess cement without crown deformation. Die stone blocks used in the present study had both added advantage of flat surface and also painting of die spacer directly on die stone for better comparison. 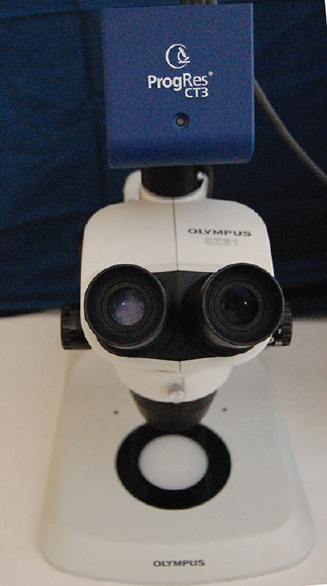 Special care was taken while measuring thickness in stereomicroscope, not to in include abruptly thick layer to eliminate the possibility of surface porosity on die stone blocks. To achieve optimal thickness, all components of die spacer liquid must be properly dispersed and the composition held constant for optimal clinical effectiveness. Maximum die spacer film thickness with increased open bottle time probably is caused by subsequent high concentration of metallic oxide particles due to evaporation of volatile solvents in the die spacer solution, resulting in more metal oxides being applied per brush stroke. Shaking the bottle after they are left open for different time intervals, followed by vibrating homogenize the solution, else particles tend to remain near the bottom of the bottle. This possibly congregates resulting in insufficient number of the particles captured by brush to obtain full thickness of die space. In the present study, die spacer bottles were hand shaken vigorously for several minutes for thorough mixing all components. There is a variation in thickness between different commercially available die spacers. The American Dental Association Specification No. 8 has established a maximum film thickness of 25 μm for dental cement. Donovan et al. and Campbell stated that the optimum thickness of a die spacer has never been scientifically established. However, the generally accepted range is approximately 20–40 μm. Hembree and cooper used four layers of Tru-Fit die spacer; Eames et al. also used four layers of Tru-Fit die spacer to achieve 25 μm thickness; and Campagni et al. applied die spacer to stone dies and measured the actual thickness of the spacing materials. They found that two layers were 26.55 μm, four layers 58.87 μm, six layers were 77.7 μm thick. Rieger et al. showed that the thickness of the Tru-Fit spacer was approximately 6–7 μm/coat depending on the sequence of application and whether the silver- or gold-colored die spacer was measured. The mean thickness of a layer of silver-colored die spacer was 6.95 ± 1.14 μm and for gold colored was 6.03 ± 1.14 μm. Suggesting consistency within gold- and silver-colored die spacer of Tru-Fit die spacer is excellent. Rafael Grajower reported new and old spacer suspensions. The average thickness of one-layer new spacer was 23 μm for the silver and 15 μm for the gold-colored die spacer. He calculated that the average thickness of layers of Tru Fit die spacer was 19 μm in new suspension and the thickness increased to 32 μm when the container was periodically opened in routine use for 6 months. He recommended application of spacer to the shoulder margins of dies to decrease in elevation of crown after cementation. The thickness of die spacer in his study did not affect the elevation, but increased the cement thickness at the axial walls. In the present study, alternating layers of gold and silver die spacer were used. In the present study the DII T had mean thickness of 19.72 ± 0.25 μm for 4 coats of TruFit die spacer at 0 h. As the time interval of bottles left open increases, the number of applications has to be decreased to reach the optimal thickness, as the evaporation affects the thickness of die spacer. 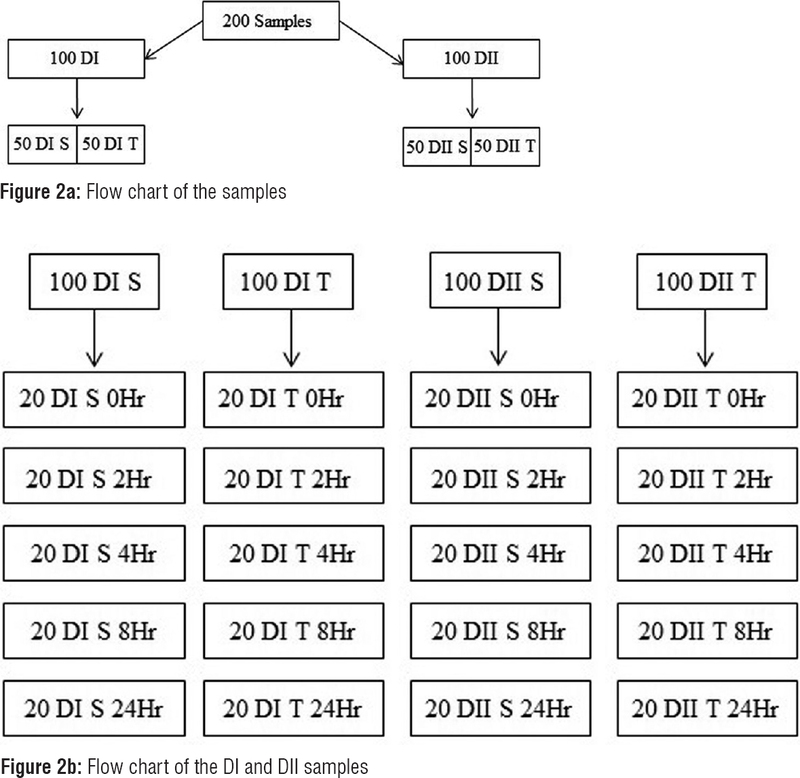 The 147% of die spacer thickness increase at 24 h for DIIT is not similar Psillakis et al study, in which 329% increase was found at the end of 24 h when compared with 0 h. A similar study by Ishikiriama et al showed that 140% increase in thickness for TruFit bottles of 6monthold compared to new bottle. When the die spacer bottles were periodically opened in routine use for 6 months, the thickness increased to 32 μ from 19 μ(average thickness of layers of the new Tru-Fit die spacer). In the present study, the mean die spacer thickness ranged from 16.64 ± 2.28 μ to 28.74 ± 3.18 μ, irrespective of number of applications and at various time intervals. It is possible that such large increases in die spacer thickness with open bottles at various times are clinically significant. The results of this study for die spacer thickness per brush application ranged from 7.06 to 12.38 μm/layer within the range mentioned in literature. Based on the results of this study, it can be suggested that there is a significant increase in the thickness per coat of applied die spacer with the increase evaporation times for both the die spacers, but when the thickness values of both the die spacers were compared, there is slight increase in thickness for Tru-Fit die spacer compared to Surana die spacer though statistically insignificant. In this study, more emphasis was made for analyzing the actual thickness of die spacer on the flat surfaces, rather than on prepared tooth die, which has various surfaces, corners, and slopes leading to pooling of the die spacer at some areas and thinning at other. This study limits to evaluate the effect of thickness of die spacer at different evaporation times and number of applications. A similar study using prepared tooth die can be done to calculate the thickness on different surfaces, inclines, and corners and its effect on the cement layer. Four coats of TruFit die spacer applied on Synarock die stone block and five coats for other variables resulted in optimal thickness for freshly opened bottles. The indigenous die spacer and die stone used in the study gave statistically acceptable results compared to common die spacer and die stone. Anusavice KJ. Phillips Science of Dental Materials. 11th ed. Philadelphia, PA: WB Saunders; 2003. p. 451. Emtiaz S, Goldstein G. Effect of die spacers on precementation space of complete-coverage restorations. Int J Prosthodont 1997;10:131-5. Passon C, Lambert RH, Lambert RL, Newman S. The effect of multiple layers of die-spacer on crown retention. Oper Dent 1992;17:42-9. Carter SM, Wilson PR. The effect of die-spacing on crown retention. Int J Prosthodont 1996;9:21-9. Rieger MR, Tanquist RA, Brose MO, Ali M. Measuring the thickness of a paint-on die spacer. J Prosthet Dent 1987;58:305-8. Koyano E, Iwaku M, Fusayama T. Pressuring techniques and cement thickness for cast restorations. J Prosthet Dent 1978;40:544-8. Campagni WV, Wright W, Martinoff JT. 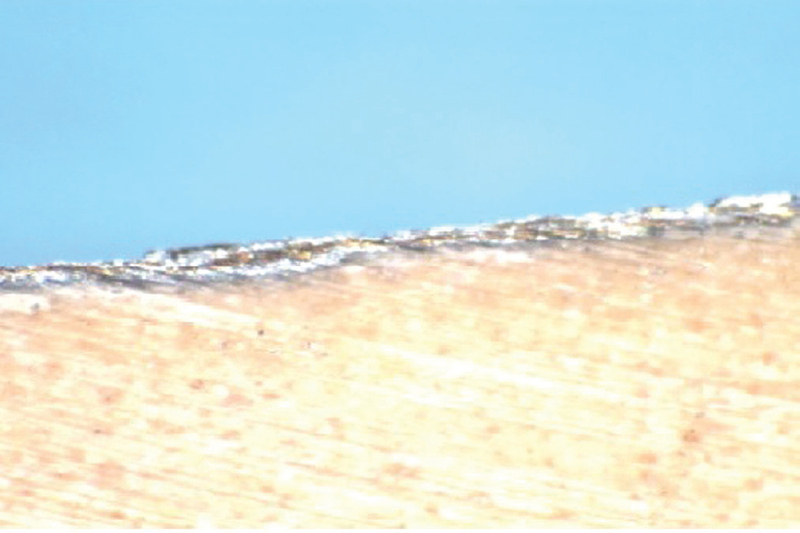 Effect of die spacer on the seating of complete cast gold crowns with grooves. J Prosthet Dent 1986;55:324-8. Grajower R, Zuberi Y, Lewinstein I. Improving the fit of crowns with die spacers. J Prosthet Dent 1989;61:555-63. Braggers KJ, Braggers H. Internal venting of castings to improve marginal seal and retention of casting. J Prosthet Dent 1987;58:270-3. Wilson PR. The effect of die spacing on crown deformation and seating time. Int J Prosthodont 1993;6:397-401. Oliva RA, Lowe JA. 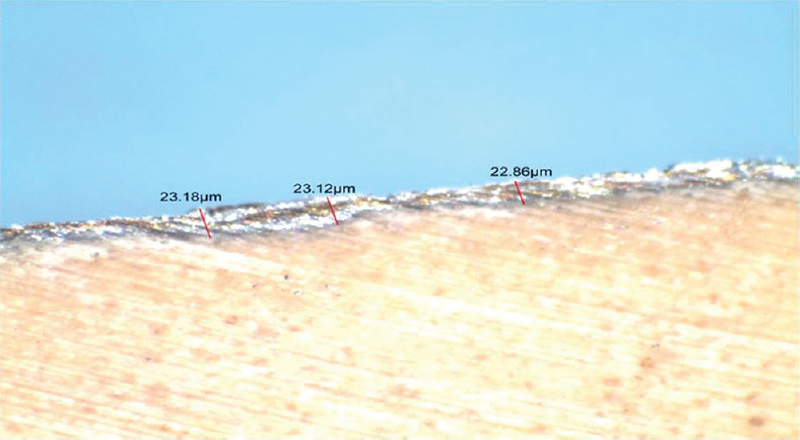 Effect of die spacer on the seating of cast restorations on composite core preparations. J Prosthet Dent 1987;58:29-35. Gegauff AG, Rosenstiel SF. Rrassement of die spacer with dynamic loading during cementation. J Prosthet Dent 1989;61:655-8. Psillakis JJ, McAlarney ME, Wright RF, Urquiola J, MacDonald DE. Effect of evaporation and mixing technique on die spacer thickness: A preliminary study. J Prosthet Dent 2001;85:82-7. Campbell SD. Comparison of conventional paint-on die spacers and those used with the all-ceramic restorations. J Prosthet Dent 1990;63:151-5. Campagni WV, Preston JD, Reisbick MH. Measurement of paint-on die spacers used for casting relief. J Prosthet Dent 1982;47:606-11. Hembree JH, Cooper EW. Effect of die relief on retention of cast crowns and inlays. Oper Dent 1979;4:104-7. Ishikiriama A, Oliveira Jde F, Vieira DF, Mondelli J. Influence of some factors on the fit of cemented crowns. J Prosthet Dent 1981;45:400-4. Carter SM, Wilson PR. The effects of die-spacing on post-cementation crown elevation and retention. Aust Dent J 1997;42:192-8. Vermilyea SG, Kuffler MJ, Huget EF. The effects of die relief agent on the retention of full coverage castings. J Prosthet Dent 1983;50:207-10. Rosenstiel SF, Gegauff AG. Improving the cementation of complete cast crowns: A comparison of static and dynamic seating methods. J Am Dent Assoc 1988;117:845-8. Breeding LC, Dixon DL, Bogacki MT, Tietge JD. Use of luting agents with an implant system: Part I. J Prosthet Dent 1992;68:737-41.